Yang, Q., Jones, V., Kumar, P., and McCue, L., “Validation of a SPH-FEM Model for Seal Dynamics of Surface Effect Ships” Naval Engineers Journal, Volume 125, Number 4, December 2013. 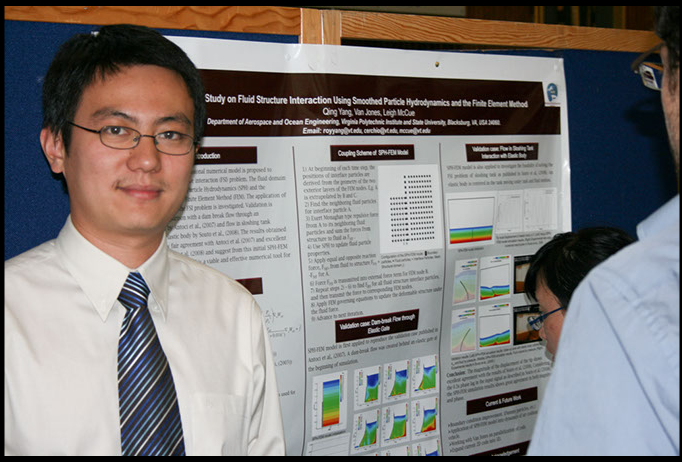 I recently checked in with alum, Dr. Qing Yang who defended his PhD degree in December 2011 in the field of SPH simulation of fluid-structure interaction problems. He is now working as a naval architect in Kvaerner Field Development, a Norwegian oil service company specialized in EPC (Engineering, Procurement and Construction) of offshore platforms. His main job is to analyze the hydrodynamic load on the offshore platform and its mooring systems and the dynamic response of offshore platforms. He also notes he is now engaged: congratulations Qing! Yang, Q., Jones, V., and McCue, L., “Free-surface Flow Interactions with Deformable Structures Using an SPH-FEM Model,” Ocean Engineering, Volume 55, December, 2012, pp. 136-147. Kumar, P., Yang, Q., Jones, V., and McCue, L., “Coupled SPH-FVM simulation within the OpenFOAM framework,” IUTAM Symposium on Particle Methods in Fluid Mechanics, Lyngby, Denmark, October, 2012. Congratulations Dr. Qing Yang who successfully defended his PhD thesis in December, 2011! You can peruse Qing’s thesis here: SPH Simulation of Fluid-Structure Interaction Problems with Application to Hovercraft. For more on Qing’s various publications, click on the tag ‘Yang‘ on this site. Yang, Q., Jones, V., and McCue, L., “Investigation of skirt dynamics of air cushion vehicles under non-linear wave impact using a SPH-FEM model,” 11th International Conference on Fast Sea Transportation (FAST), Honolulu, HI, September, 2011. Jones, V., Yang, Q., and McCue, L., “SPH Boundary Deficiency Correction for Improved Boundary Conditions at Deformable Surfaces,” Ship Science and Technology/Ciencia y Tecnología de Buques, Volume 4, Number 7, July 2010.